The "Duel in the Desert" is the nickname given to the annual heated college football rivalry between the University of Arizona Wildcats and the Arizona State University Sun Devils. Now scheduled each year on the Saturday following Thanksgiving, the site alternates between the home of the Wildcats in Tucson and the home of the Sun Devils in Tempe. But for golfers contemplating a golf trip to Arizona, they face their own 'duel in the desert' quandary -- should I go to Tucson or Tempe for my golf vacation? With Tempe being located nearby to Mesa, Phoenix, and Scottsdale the decision to visit this locale often trumps the alternate choice of Tucson. But with less hustle-bustle and a more laid back atmosphere, many golfers are now choosing Tucson as their golfing destination. What often sparks interest for Arizona golf is the stark contrast that the desert southwest landscape offers. It is common that golf visitors to Arizona are accustomed to flat, tree-lined, 'classic style architecture' courses back home. The contrast of Arizona's desert-style target golf courses with desert-style scenery of cacti, mountains, rocks, roadrunners, quail, and sun is quite appealing. 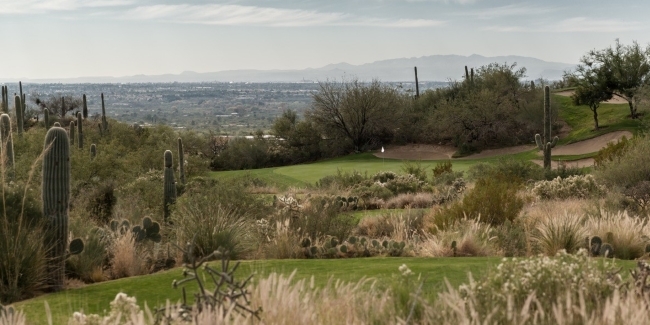 While both Tempe and Tucson are located in the Sonoran desert, and both Tempe and Tucson can offer the same rugged, beautiful scenery on many of their local courses, here is a review of two Tucson courses that might help Tucson win the golfing "duel in the desert." Opened in 1995 and designed by Robert Trent Jones, Jr., Arizona National is the new name of the course formerly known as Raven Golf Club at Sabino Springs. Now managed by OB Sports, Arizona National is a public golf facility nestled in the foothills of the Santa Catalina Mountains. 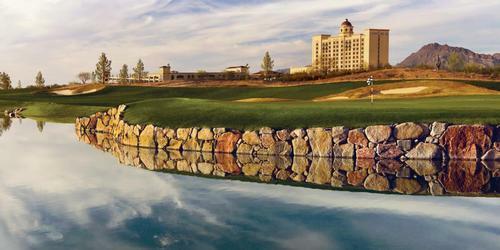 Its fairways flow across a landscape featuring mesquite-lined arroyos and craggy rock outcroppings. Golfers can possibly lose their next-shot focus should they look up at the stunning panoramic mountain vistas or forests of giant suguaros. Arizona National plays to a par of 71 (35-36) and offers fours sets of tees and one optional combo set; longest black = 6,785 yards; shortest red = 4,414 yards. Intermediate tees are blue = 6,340 yards and white = 5,588 yards. Many golfers feel that the strength of the course lies in its collection of five par-3's, four of which will require tee shots that must carry over rugged desert terrain, while the other par-3, hole #9, is the longest and plays uphill. 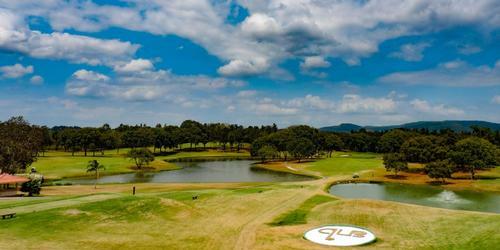 A spectacular finish awaits 'AZ-N' golfers; standing on an elevated tee box, the entire challenge of hole #18 is visible. The finale is a par-5 and should be played as a mild dogleg left, but a large lake awaits down the left side for the last 165 yards of the approach to the green; big hitters who want the reward of a putt for eagle will risk a 'watery grave'. The seating of the Wildcat Grill, the 19th hole, looks out across the 165 yard lake and views the giant symbolic logo "A" of the University of Arizona, whose golf teams played here for many years -- Lorena Ochoa, Natalie Gulbis, Rickey Barnes, Rory Sabbatini, and other greats have teed it up here. La Paloma Country Club is a 27-hole golf facility designed by Jack Nicklaus that opened in 1984; while being among his earlier designs, it may also be considered one of his finer designs. 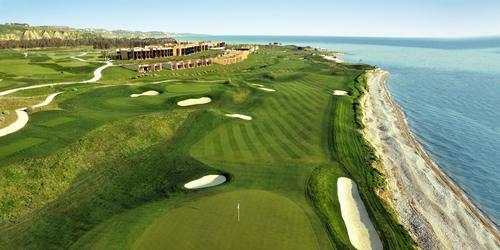 La Paloma is a Jack Nicklaus Signature golf course. The golf facility is both a private country club and a resort course. Going back to 1988, La Paloma Country Club has been consistently named each year as one of America's Top 75 Resort courses by Golf Digest; similar awards by GolfWeek, Golf Magazine, and Conde Nast Traveler have also given honor to the La Paloma course. It may be difficult to believe that Jack Nicklaus was not born in the desert (b. 1940 Upper Arlington, Ohio) as he nailed this Sonoran layout design. The 27 holes wind their way through dramatic canyons and desert foothills, and look up at the Catalina Mountains. Now offering six sets of tees, the three La Paloma courses are a strategic challenge to players at every level of skill and experience. All three nine-hole courses (Hill, Ridge, Canyon) play to a par of 36, and the total length for each nine is approximately equal. In true Nicklaus-esque fashion, there is a premium reward given to precise approach shots; a fine example of this necessary precision is the approach to the par-5, #2 hole on the Canyons nine. This hole is a 'fishhook' design that tempts golfers to take the shortest distance, but a long carry, over the canyon filled with desert scrub; playing the hole conservatively down the left side will be the safer route, but still leaves the golfer with a mandated precise short iron shot to the well guarded green. La Paloma Country Club is managed by Troon Golf and the adjacent Westin La Paloma Resort offers all the relaxing amenities golfers could ask for after their round: lodging, spa, casual and upscale dining, and the popular swim-to bar. 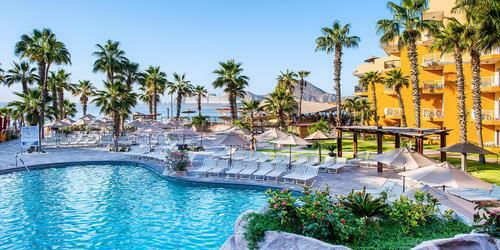 Recently refurbished with $35 million in upgrades throughout facility the Westin La Paloma is sure to satisfy. Arizona National and La Paloma Country Club are 'dual desert' reasons to choose Tucson as your Arizona golf destination. Greg Miles is Senior Writer for GolfChicago! Magazine and resides in Lake County, IL. He has been a golf writer for 21 years, and a member of the Golf Writers Association of America for the past 17 years. A graduate of the University of Notre Dame and Marquette University, he has played more than 5,500 rounds of golf in his life at 462 different courses; enjoys collecting golf memorabilia and is a Golf Nut Society member.